It is composed of load frame, measuring parameters displayed Unit, Strong lectricity control Unit, Test bracket, etc. The load frame use double columns structure. The motor is up setting. The impact pendulum is taking to requested height by steel wire. 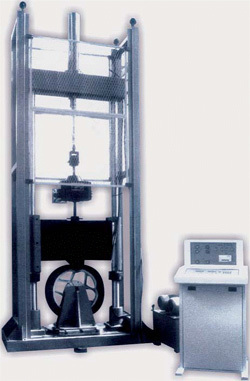 The height is collected by photoelectric coder. Twice display the height value which can be read directly to ssure the accuracy and reliability of test data. Impact pendulum is self-locking in normal condition. When air pressure meets requirement, instantly release by manually control the button on control box to omplete impact, the device is safe and reliable. Impact pendulum equipped with twice impact device to realize twice impact towheel. Strong electricity control Unit drives motor and pneumatic parts. Safety cover guarantees the safe of operator.